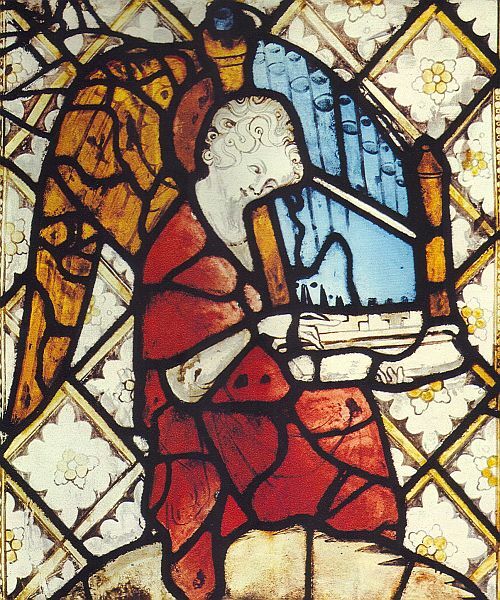 The Portative Organ was one of the most popular instruments of the thirteenth through sixteenth centuries. Relatively light in weight, the instrument, when equipped with a sling, could be carried about and played in religious processions. The player provides his own wind supply by pumping a bellows made of sheepskin and wood with his left hand while playing a button type keyboard of approximately two octaves with his right hand. Because of its limited air supply, the Portative Organ could only play one note at a time. Thus it was used for monophonic dance music, or a single part in a motet, chanson, or other polyphonic work. Pipes are arranged in one or two rows and have a high lead content. The key action is mechanical: depressing a key allows air from the bellows to enter the appropriate pipe. Although the Portative Organ is tuned in Pythagorean temperament, other temperaments are possible by pushing harder or more lightly on the bellows. The Renaissance Workshop Company Ltd. produces two Portative Organs. They are the culmination of extensive research into the construction of very many small portable organs. The metal pipes operate on only 2 inches of air pressure from the single stroke bellows and produce a clear full sound. Shorter musical passages can be played with ease whilst longer passages are played by 'phrasing' the music to give a space (in the same way a singer takes a breath) to re-charge the bellows. Both are made from selected oak for all the casework parts, which are finished to a very high standard with all mouldings pre-cut and hand made pipes individually voiced and tuned before final fitting and setting up of the finished organ. The 1ft Medieval Portative Organ (F-ORP-1) is a miniature organ of traditional construction in almost every detail. The instrument is supported by a leather strap slung over the shoulder and played with one hand leaving the other free to operate the bellows. Our 1ft Portative has a simple pallet action and 12 hand made pipes. Disposition: 12 notes c' - g'' (diatonic range). Size: 18"/14" (46cm/36cm) high, 12" (30cm) wide, 4"(10cm) deep. Weight: 8lbs (3.5kg). 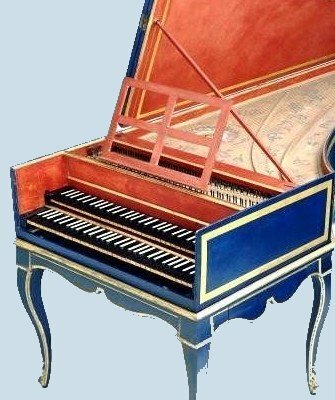 The 2ft Portative Organ (F-ORP-2) is a small organ of traditional construction in almost every detail. 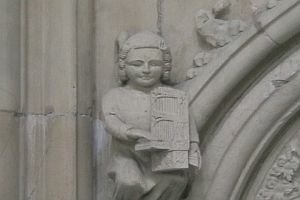 The instrument is played in a seated position, the bellows are blown with one hand leaving the other free for the keyboard. Our 2ft Portative Organ has a conventional mechanical action and 25 hand made pipes. Disposition: 25 notes c - c'' (chromatic range). Size: 38"/24" (96cm/60cm) high, 17" (44cm) wide, 14" (34cm) deep. Weight: 42lbs (19kg). 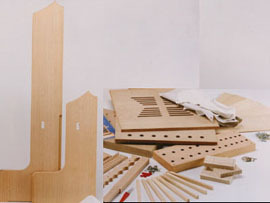 These organ kits have been designed throughout for accuracy and ease of assembly. 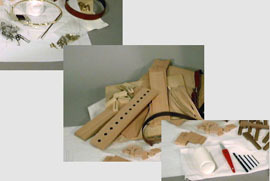 The construction of the bellows of a hand blown organ is the most complicated part of its assembly. The bellows in our kit have been specially designed to be simple to make yet effective for playing. The keys and keybed are pre-drilled leaving no margin for error and the soundboard is fully formed with all windways/boring completed. All the casework parts are machined to size from solid oak and have the detailed edge mouldings pre-cut (oak veneered plywood is used where stability is essential). Lime pallets, rosewood keys, white leather, split skin, deer skin, balance pins, pallet springs, felt, washers and fixings are all included. 'Spotted' metal pipes, voiced ready for final tuning, complete this comprehensive kit. Our 1ft Portative Organ Kit (K-ORP-1) builds into a truly portable little organ with a diatonic range of 12 notes c' - g''. Traditionally difficult parts such as the bellows have been carefully designed to be straightforward to make and the soundboard is fully formed with all the windways and boring completed. 1ft Portative Organ kit without pipes (K-ORP-1W). Start building a 1ft portative organ for less than 1/2 price. Build a 1ft portative organ for the minimum outlay. This version of our 1ft portative organ kit supplies everything except the metal pipes leaving you the option to purchase them later when all the woodworking is finished. Our 2ft Portative Organ Kit (K-ORP-2) builds into a portable table top organ with a fully chromatic range of 25 notes c - c''. Traditionally difficult parts such as the bellows have been carefully designed to be straightforward to make and the soundboard is fully formed with all the windways and boring completed. Lime pallets, rosewood keys, white leather, split skin, deer skin, balance pins, pallet springs, felt, washers and fixings are all included. 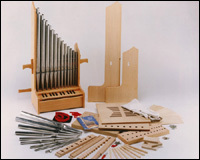 2ft Portative Organ kit without pipes (K-ORP-2W). Start building a 2ft portative organ for less than 1/2 price. Build a 2ft portative organ for the minimum outlay. This version of our 2ft portative organ kit supplies everything except the metal pipes leaving you the option to purchase them later when all the woodworking is finished. You can make the same Portative Organ from scratch, following detailed step-by-step instructions through the construction process in a clear and concise manner. 1ft Portative Organ Plan: hard copy (P-ORP-1) or electronic files (D-ORP-1). 2ft Portative Organ Plan: hard copy (P-ORP-2) or electronic files (D-ORP-2). Set of pipes for 2ft portative Organ (K-ORP-2P). A set of 25 pipes, hand made in spotted metal, individually voiced ready for final tuning when fitted to your finished instrument. Chromatic range c - c''. For security and service quality, we need your orde in writing and cannot ta phone.